At a training session today, I was surprised and very pleased to get a chair with a writing frame for left-handed people of which I am one. It was just as surprising to find that of the five people selected at random for my group, three of us were left-handed and there were plenty of lefty chairs to go round. Thanks to the organisers for their kind consideration - nothing was left to chance. The National Gallery of Art in Dublin is a place I like to visit regularly. Even when it is undergoing refurbishment its curators find ways to engage visitors. I'll be adding some thoughts on this below shortly. Meantime this quote, alongside the statue of George Bernard Shaw, caught my attention and has remained in mind. Thought I'd share. Link to the gallery here. Sometimes it can be hard to organise thoughts against the pressure of deadlines. Think of that report that's due. You've several options to consider and time is short, what one to go for? Or you have an upcoming presentation and you want to be sure you are in command of the facts. Maybe you are a student preparing for an exam. How best to assimilate all the information and still be ready to pick out the salient points and organise them for your argument? At times like this it can be hard to hear yourself think. In preparing for such eventualities I like to take some time to myself and most often play some music to help me concentrate. I am a regular listener to the radio station ClassicFM and it has suggested a playlist for students as an aid to concentration. Take a moment and check it out here . 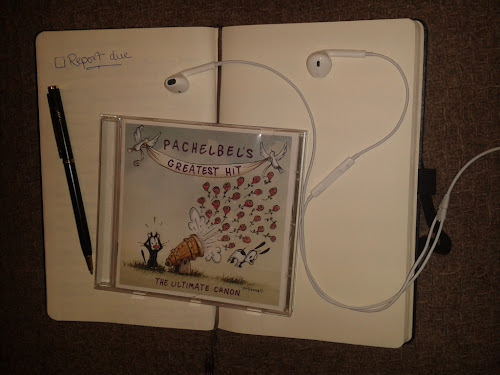 If you've checked out the playlist you will see that the station recommends starting at the Pachelbel Canon. It's one of my favourite pieces for helping me organise thoughts. There is something about that recurring rhythm that builds and builds that makes it a perfect aid to concentration. At least that's what I have found. When I first started using it, many years ago now, I put the recording onto repeat play. Then when I heard about a CD that is a compilation of different arrangements of the piece I decided I had to get it. I am on my second cd now, the first which I suggested to a friend to try didn't make it back to my collection and had to be replaced. It's called Pachelbel's Greatest Hit - the ultimate canon and it features fifteen distinctively different performances of the same music. I love the various treatments including a vocal interpretation from Cleo Laine. And I've found that somehow as I work along to the music the thoughts seem to flow and yes... I can hear myself think. I'd love to know why it works. Perhaps it's become an anchor for the mental state needed for concentrated work. Whatever the reason/s, when that deadline for an exam, presentation or report concentrates the mind it's nice to have the big guns on your side.